Pools of warm sweat filled the space beneath my arms, and my heart doubled its pace during the seconds between when I handed Leila her birthday present and when she finished ripping off the wrapping paper. First, she looked intensely at the box, daring her X-ray vision to reveal what was inside. She weighed the box in her hands, inspected it for telltale air holes (sorry, no kitten this year!) and cautiously shook it. She then shredded the wrapping paper with thunderclap rips, as if she hadn’t eaten for a week and a thick, juicy hamburger waited inside. A pile of red, Happy Birthday confetti fell to the floor. “Oh, Mommy and Daddy! I love it!” Leila’s eyes opened wide, accompanied by a broad smile that I thought would become a permanent fixture on her face. All my worries had been for nothing. Leila rested the watch on her palm and ran her fingertips over the smooth crystal. “Ooo,” she said. Then she did it again, rubbing the watch crystal the way somebody might rub Aladdin's lamp. “This is the best present ever,” Leila said as she strapped the watch around her wrist. 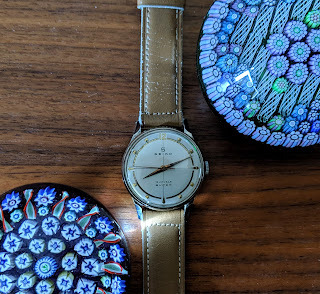 Old Hamiltons, like many watches from the 1960s, were tiny by today’s standards and a man’s watch from that era comfortably fit my nine-year-old girl. Leila gently wound the stem like she was petting a baby bunny, and her eyes followed the small second hand at the watch's six o’clock position. She sat in wonder for the full minute that the watch’s second hand took to rotate from twelve, through six, and then back to twelve. “Thank you!” Leila looked at us, then her watch, and then us again. “Can I wear it to school tomorrow?” She held her watch arm up high. “But not in the shower or bath,” I added. “Daddy! I’m smarter than that.” Leila stomped her foot once for punctuation. “I thought that was going to be my piece,” I said. At about eight o’clock I invited myself into Leila’s bedroom because I thought that she’d like a few minutes’ homework break. Leila wasn’t there. She must be in the bathroom. But I didn’t hear any noise. I waited. A minute. Then two. Then three. I knocked on the bathroom door. “Leila? Are you there?” I asked again, this time more loudly and with even more vigorous knocking. Julia heard the racket and came up from the living room, her feet flying up the stairs like she was escaping from a fire. Julia pressed the handle down and pushed the door in. The door was unlocked and the bathroom was empty. The light was off and the window was closed. Immediately we separated and searched the house yelling “Leila, where are you?” as we opened doors, looked behind curtains, in closets, and under furniture. I opened the refrigerator, too. And then back to the same places we had just looked, just in case somehow we hadn’t seen her on the first search. We searched fast, more frantically, driven by dread. I went outside and circled the house, even though the front and back doors were chain locked. I ran down to the basement two steps at a time. I checked everywhere, even the washer and dryer. “Leila! Where are you?” We searched the upstairs for the third time. “What was that?” Julia shouted. “That was me. Sorry. I slammed the door shut. I’m getting angry. What kind of game is Leila playing?” I shouted back. I hoped it was a game. Whether I’d wrap my arms around her in relief or scream at her for frightening me and her mom was something I’d decide later. “Daddy!” came a weakened voice from downstairs. Leila. “I was here,” she said. “What do you mean you were here?” I demanded. “We looked all around the house. We didn’t see you anywhere. You scared us to death.” I instantly regretted my harsh accusation. “Yes, you are,” I answered even before she’d finished the last syllable of her question. “You just had too much cake. And too much excitement mixed with all that sugar made your imagination run wild.” I bit my lip. I wanted to hit my head against a wall in penance for assuming that Leila was playing a hiding game. “You’re alright” Julia said. She rubbed Leila’s back, and Leila pressed her back into Julia’s hand, like a cat that’s enjoying its owner’s attention and touch. Pink returned to Leila’s face. Her breathing slowed to a more normal rhythm, and she stood taller. Kids have powerful nighttime and daytime dreams. I had forgotten how potent daydreaming is because at work my daydream about whirling through my office building’s revolving door into a world of brilliant blue sky and yellow sunshine and joining my family on the beach is just a pleasant, short, and unfulfilled interlude between reports and meetings. My daydream is written on fragile tissue paper, and dissolves in that Caribbean ocean the moment my phone rings or computer notifies me of a new email. But for child like Leila, daydreams are places, people and objects she can touch, smell, and hear. A child can feel the crunch of sprinkles and nuts on her ice cream, and will giggle as a cat’s tail tickles her neck — all in a daydream. “Tell us what happened, sweetie,” Julia said. Her voice was calm and smooth, which surprised me. “That explains everything. The Elizabethan Age was England’s notoriously boring era. Anyone would prefer to dream about birthday cake and presents rather than read about Queen Elizabeth,” I said. “That’s a good idea. A good night’s sleep will make you feel right as rain,” I said, using Leila’s favourite expression—every time she asked me where it came from, I offered a different theory. My most recent explanation was “The rain falls on the right side of the street first, cleaning that side.” We didn’t care about the actual origin of this idiom; we enjoyed our right as rain tradition, our special ritual, just the way it was. “I’ll put a new battery in your clock and set the alarm for seven AM while you brush your teeth,” I told Leila. She pouted. “It’s a school night and your alarm’s going to ring at seven whether you like it or not.” She pouted harder. “Sorry,” I said. “I think your alarm clock likes waking you up at seven on school mornings. It’s evil.” Another pout, this one even more severe. “I will change the day of the week for you and make tomorrow Saturday.” Now Leila smiled. Leila understood the rule of mornings in our house: first person in the bathroom has control of that room for as long as they want, and no knocking allowed. A simple rule, yet with consequential implications. On school days, at precisely 7:00:05, I hear the patter of Leila’s feet, followed by the bathroom door sealing shut. For the next twenty minutes, the bathroom was a high-security, off-limits area—entry or even approach were prohibited. Sometimes, Gaston enforced that rule by patrolling in front of the bathroom, prepared to snarl for the first time in his life if anyone appeared to be reaching for the door handle. But this morning, I didn’t hear anything. I mean, I didn’t hear Leila’s dash for the bathroom or the door shutting. All I heard was her alarm, which continued its daybreak siren unabated. Leila always swiftly slapped the off button, like she was swatting a mosquito, but this morning the ringing went on and on and on. I got out of bed and opened the door to Leah’s bedroom, but she wasn’t there. And she wasn’t in the bathroom either. Julia leapt out from under the blanket, which nearly flew to the ceiling before fluttering back onto the bed. By the time the blanket had landed, Julia was fully awake and sitting upright. She looked around the room as if she could summon Leila with her searching eyes. She seemed to have succeeded. Our bedroom door opened. There was Leila, silhouetted by the hallway light, standing in her sheep pajamas. “Mommy and Daddy. I went somewhere again,” she said. Leila was trembling as she talked. Julia and I laid beside and held her, transformed into a human sandwich. “It was here, the middle of the night, when I thought it was seven. It was 2:12 in the morning. I saw your bed clock. I got up and walked into your bedroom. You were both fast asleep. Gaston padded into the room and laid on the floor in front of the bed. His always wagging tail thumped against the carpet. “I’ll call Dr. Sullivan’s office,” Julia said. The pediatrician’s office was a hubbub of coughing, sneezing, and wheezing. The well-waiting room where we sat had only three kids in it; the more isolated room—what we called the sickies’ room—was packed, and it was from that room the cacophony of illness sounds emerged. We waited forty five minutes before Dr. Sullivan could see us. After we described Leila’s two disappearances, Dr. Sullivan put her hands on Leila’s neck. She took Leila’s temperature. She listened to her heart and lungs. She looked into her ears and eyes. All the standard pediatrician stuff. But no blood taking, which I’m sure Leila was fine with. “What do you think it was?” I asked one last time. I was disappointed, but also relieved. On the one hand, I was hoping there was a name and cure for what had happened to Leila—a shot or a pill—but on the other hand, I was glad Dr. Sullivan, whom we trusted more than any other human being on the planet, found nothing wrong with her. And Leila was energetic, alert, happy. Nerves. Sugar. Stress. Human bodies and minds are as complicated as they are inexplicable. Whatever had happened was probably inconsequential, or if it had been something, it had passed. And yet...where had Leila gone? Leila rested, did a little homework, spent time on the computer, and watched a movie for the rest of the day. When seven o’clock on Friday morning rolled around, Leila’s alarm sounded for its usual five seconds, followed by the door to the bathroom slamming shut. Everything was back to normal. When Leila walked in the house after school I could see in her face that it had happened again. She stood in the foyer, sadness dripping down her cheeks, her hands, legs, entire body shaking. “Daddy,” Leila said as she walked to me. “Tell me what happened.” I knelt to be closer to eye level with her. “Your alarm clock had stopped?” I asked. No. Not possible. The thought going through my head was impossible. This was not in the realm of what the laws of physics allowed. No way. I tried to push the thought out of my head, but it was the only one that made sense, and like a cat intent on waking you in the morning, it kept returning no matter how hard I tried to ignore it. Leila was traveling back to whatever time was displayed on a stopped clock. I heard Sherlock Holmes’ words inside my brain: “When you have eliminated the impossible, whatever remains, however improbable, must be the truth.” There was no other explanation besides time travel. Leila didn’t seem satisfied by my terseness, but she didn’t seem upset, either. She may be a tween, but at this moment, her mom and I were her anchors. Everything would be better with both of us near. I explained to Julia what I thought was happening to Leila. She didn’t believe me at first. She didn’t believe me after I repeated Leila’s story. She didn’t believe me after a glass of wine, either. We talked in the kitchen, out of Leila’s hearing range, until finally Julia acquiesced: It was possible that Leila was traveling back in time. Possible, but just barely. I had to know for sure. Ninety-nine point nine percent certainty isn’t the same as one hundred percent certainty. I proposed a test in a controlled and safe place—our living room. I explained to Leila what I thought was going on. I don’t know how easily the mind of a nine-year-old accepts weirdness—perhaps better than an adult does—but Leila seemed to believe us when I told her I thought she was traveling back through time to the moment the clock or watch she was looking at had stopped. Kids live in the magic age of instant communications, virtual reality, self-driving cars, 3-D printers, and delivery drones. Stir advanced technology into a soup of science fiction books and movies—the stuff that Leila had grown up with—and nothing surprises you anymore. What’s time travel but another technology come to pass? Leila agreed that it would be a good idea to test this theory in the safety of our living room. I adjusted the time on my own watch back fifteen minutes to 6:10 PM. I watched as Leila turned her gaze to my wrist, but she never had a chance to say anything. Leila vanished from the couch. There was no flash of light. No popping or other sound. No twinkling or fading. No sparking or electrical smells. She was just gone. Julia and I didn’t move. We were afraid to move, afraid we might occupy the same space in which Leila would re-emerge. Our muscles were shocked into paralysis. We waited. I didn’t know how long it was, but five, ten, maybe fifteen minutes later, Leila came back. It’s impossible to keep track of time when your heart is beating at the speed of light. Leah was standing in the vestibule between the front door and living room, the late afternoon light tinting her brown hair with a yellow brush. 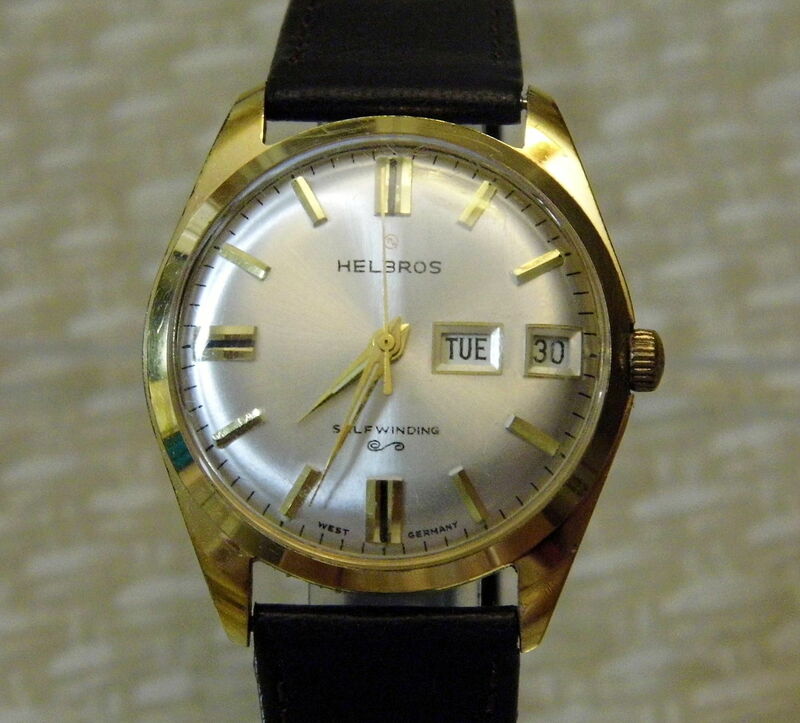 I looked at the living room clock, took my phone out of my pocket, and leaned over to see Julia’s watch. They all agreed: 6:25. Leila had traveled fifteen minutes back in time. “We’ll get them all,” Julia added. “I think Leila should wear them tomorrow when we drive back to school to talk with her science teacher. If she should happen to see a stopped clock on a building…” I didn’t need to finish my sentence. “I know,” Leila said. 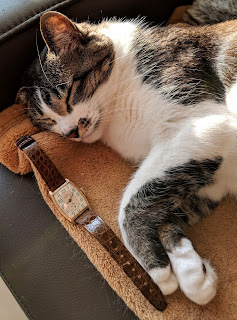 She carefully took the watch off her wrist and placed it upside down on the coffee table. She laid on the couch, pulled one of the cushions out, and turned it into a pillow. She looked at us briefly before closing her eyes. A second later, she was fast asleep. I went outside to the Volvo. Twice a year when we spring forward or fall back, I forget to adjust the car’s clock. Not so much forget as procrastinate about it. It takes about a week before I get around to changing that clock, because of all our clocks, our faded, brown Volvo’s is the most annoying to change. You have to press and hold the button for three seconds to get the hour hand to blink so that the hours can be changed. While ripping the roll of black electrical tape, I heard a car with a broken muffler approach, sounding like it was carrying a container of loose marbles. And then, a single, loud thump. The car sped away, the marbles turning into stones, rubbing against the inside of the car’s engine. A second later, as the car’s rumble grew faint, another thump—the sound of something hitting the pavement. A flat, hard sound. I bolted out of my car as a cruel uneasiness filled my lungs. Our beautiful, gentle Gaston lay on the street, blood seeping over his white and brown body and his sweet face. His lungs weren’t moving; his tail wasn’t wagging. I had left the front door open when I went to the car. It was my fault. Gaston had just wanted to come out and play. He was just being a dog. “What the matter?” Julia asked, as I walked into the living room. Leila was sitting up on the sofa. Julia was on the verge of tears, but not Leila. I guess the shock of everything that’s happened to her over the past two days has immunized her from sadness. That’s good, at least. She’ll cry another day; just not today. “I’ll get a blanket and bring Gaston in from the street,” I said, walking past them on my way to the stairs. “Leila, don’t.” But she wasn’t going to listen to me, either. 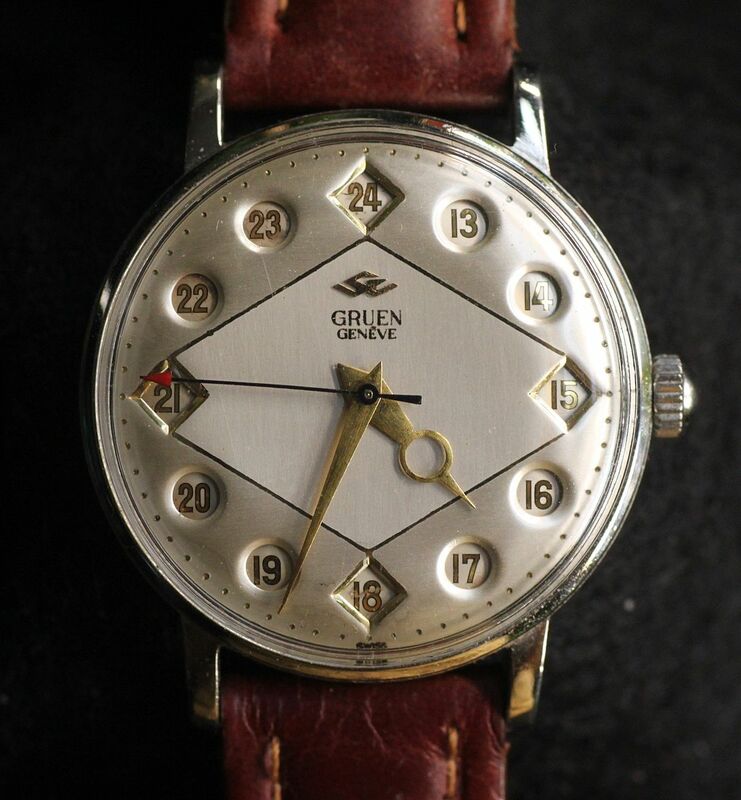 A 1950s Seiko Super...beautiful, as long as it's running. Neither Julia nor I physically restrained her. We could have, but we didn’t. Leila was right—she had just traveled back in time in front of our eyes without incident. But Julia was right, too, for reasons that I couldn’t articulate in the few seconds before Leila left. Now Leila was going back in time to change history. She was going to interact with the past. Even just saving a dog—our dog—was changing history. Was that permitted by whatever power or laws or nature allowed Leila to travel back in time? Or was it the reason that Leila could travel back in time? Did she have a purpose we didn’t yet understand? In the absence of evidence or information, I feared that there would there consequences for transgressing the laws of physics. Changing one little thing in the past might start a cascading, unstoppable calamity, like a pebble rolling down a mountainside that turns becomes an avalanche. The universe might be strong and able to absorb changes—or it might not and we might be at the epicenter of an earthquake. We might be the cause of that earthquake. A nine year-old-girl might destroy history. And even if these next minutes didn’t end the world, I worried about nature’s habit of restoring balance quickly and destructively, the way a hurricane restores the atmosphere back to calm. Leila turned her grandfather’s watch hands backwards. She held her breath as if she was about to cannonball off the side of a swimming pool into the water, popped out the crown, and stopped the watch. There was no indentation on the couch where she had been sitting moments ago. Once again, Julia and I didn’t move. I wanted to put my arms around her, hold her close, but I was afraid to change the space we were occupying. We waited. Minutes morphed into what felt like hours. Acid filled my belly and pushed its way up to my throat. A spot of blood on Julia’s palm rose on her clenched fist where her fingernail had pierced her skin. She didn’t notice. I’d never calculated how long Leila spent in the past when she jumped. I didn’t know if the length of her journey depended on how far back she went or if how long she stayed was some complex interval that only a physicist could divine. I was lulled into a near trance by the tick tock of Leila’s watch, the sound filling my brain to the exclusion of all else. But I dared not count the seconds or even look the watch. Knowing how long Leila was gone might drive that acid right through my stomach. Our little girl had changed history. The end of the world had not come. Now it was time to think. While Leila had changed only a small part of history—for which our family would be forever grateful—she had opened a door into a realm of unknown and unknowable possibilities. She had opened a door to profound risk and the potential for extraordinary good. What gods or monsters hid on the other side of the door that only Leila could open? I promise you, Leila, wherever you go, I will protect you from those unseen monsters. Somehow. Julia nodded. “We can’t go to your teacher, Leila.” She spoke with her “mom” voice—lower in tone, slower in cadence, definitive and final, the ender of all arguments. “Kind of.” Leila’s frown told me that she understood more than she was admitting. Julia stroked the back of Leila’s hand. She kissed her on the forehead, but that didn’t erase the lines in Leila’s furrowed brow. “You can’t tell Alice or anyone else.” Alice was Leila’s best friend, and there was hardly a day that Leila and Alice weren’t together after school, studying, doing homework, playing, and especially giggling. Telling Leila she had to keep a secret from Alice was like telling her that she was being sentenced to prison for ten years. “Why can’t I tell Alice? We tell each other everything. She can keep a secret.” Gaston jumped onto the sofa beside Leila. She petted him and he wagged his tail even more energetically than before. “We have another problem,” I said. Gaston barked and jumped off the couch. Leila ran after him. There was comfort to be taken from a dog that didn’t argue or tell you what you could or could not do. “What do we do now?” Julia wanted to know. “Sounds good.” Gaston barked in agreement. “With lots of salt and butter?” Leila asked, though this was more of a non-optional request than a question. I wiped my hands on my pants. “No, Daddy! Use a napkin.” We all laughed and Gaston barked again. Leila flipped channels to the rhythm of popping popcorn. I challenged her to race through them all before the popcorn was done. She started at a fast pace, but then slowed as her clicker thumb tired. She paused every now and then on various shows before moving onto the next, in the hope that something brilliant and captivating would appear around the next television channel corner. “Do you like this show?” I asked Leila. “Of the cathedral,” I corrected Leila. “The church is pretty. I especially like the stained glass and the gargoyles,” I said. Leila settled back in the couch. The pace of popping popcorn quickened, the high-pitched popcorn notes telling a tale of kernels desperate to escape the confines of the pot, working as team to push the lid up and off. Popcorn aroma, a scent like no other, encircled us, trying to steal our attention from the television. 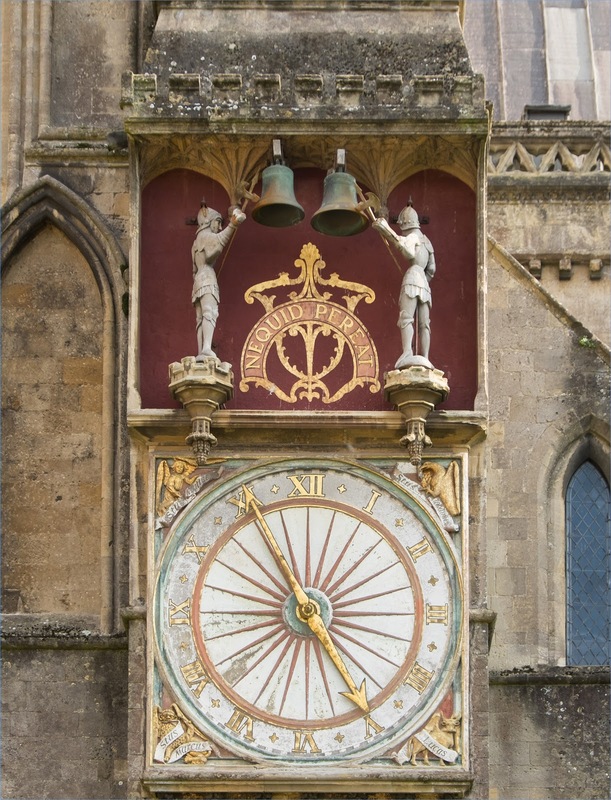 “Like many old clocks, the Wells Cathedral Clock wasn’t very accurate. It gained or lost twenty minutes a day.” The television camera zoomed in on the clock’s giant gears. The popping slowed, a welcome signal that we wouldn’t have to wait much longer. The popcorn and television were in a race to see which would come first: our snack or a commercial. I looked over at Leila, whose eyes were glued to the TV. Good, she’s relaxed. The popping sound stopped. Leila licked her lips. I heard the sizzle of butter liquefying in a pot. “The clock’s mechanism will be replaced with an electrical motor next week. The clock will be more accurate and it won’t be somebody’s nearly full-time job just to wind the clock. 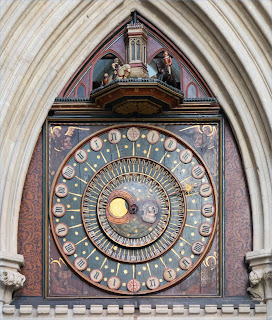 To prepare, the Wells Cathedral Clock is currently not working.” The camera zoomed in on the clock’s face, with its Roman numerals, arrow hands, and starburst lines. Leila’s eyes melted into the television screen. Her pupils opened wide and her irises turned deep blue, like the sky just before the last drop of sunlight disappears and the stars take command of the night. The clock reflected crisply in her eyes. She pressed her palms flat on the sofa; she pressed her feet hard into the floor, as if she were getting ready to spring to the ceiling. 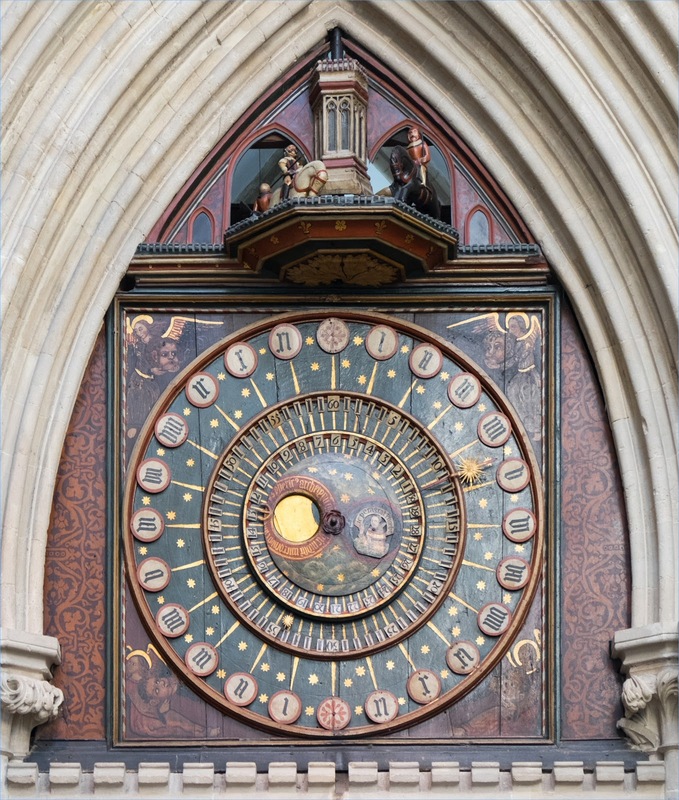 “Mark Fisher’s grandfather, Leo Fisher, started caring for the clock in 1919, after returning from military duty in World War I. Ken and Toni Fisher took over the clock between 1935 and the Second World War, after which Leo Fisher’s daughters, Ruth and Mary, took charge. I knew what was about to happen. I reached for Leila’s hand. If I hold your hand, I can keep you from traveling. The tips of my fingers had barely touched Leila’s cottony fingertips when she vanished. 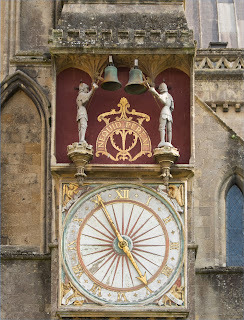 I saw Wells Cathedral Clock high atop the cathedral, the sun burning down on the gray stone. The clock’s face was the blue of fresh paint; the hand and numerals were gold that shimmered in the yellow sunlight. The cobble of horses filled my ears; I smelled dirt as those horses kicked up the earth. Acrid smells of staleness overpowered the perfume of fresh popcorn wafting in from the kitchen. Bells rang and children’s voices sang an octave above those bells. Once more, we froze in place. Julia, a statue holding a popcorn bowl and me sitting on the couch, like a museum exhibit about Twenty First Century American life. She stood with her feet together, chin lifted, staring into my eyes. I braced myself against the doorframe so I wouldn’t collapse.